China’s Recycling Policy Is Making American Cities Take a New Look at Their Trash | "Global Possibilities"
This story was originally published by CityLab and is shared here as part of the ClimateDesk collaboration. Over recent months, news coverage has depicted China’s National Sword policy as a crisis for recycling in municipalities all over the United States. Since early 2018, China has banned many scrap materials and has not accepted others unless they meet an extremely strict contamination rate of 0.5 percent. 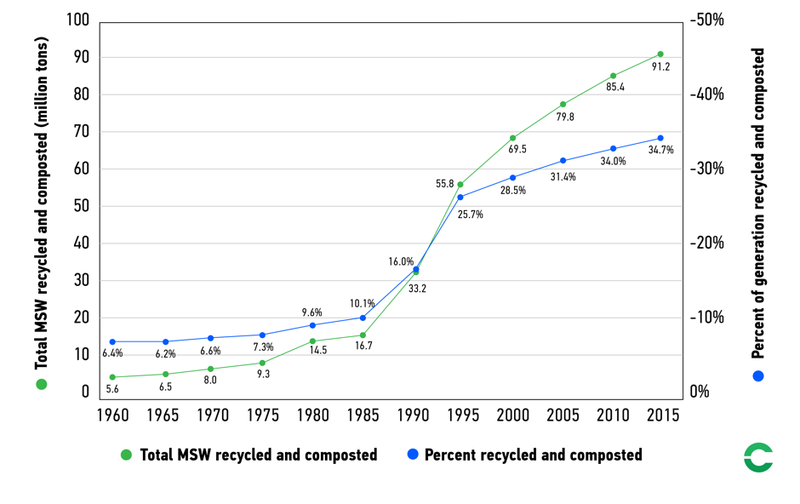 (Contamination rates of US recyclables before sorting vary from place to place, but can reach 25 percent or higher.) The decision reflects China’s desire to recycle more of its domestic waste. Previously, China had been the destination for about 40 percent of the United States’ paper, plastics, and other recyclables. Meanwhile, many municipal recycling programs in the US have suffered. As of January, Philadelphia was sending half of the recyclables it collects straight to the incinerator. Minneapolis stopped accepting black plastics. Marysville, Michigan, will no longer accept eight of 11 categories of items (including glass, newspaper, and mixed paper) for curbside recycling, in order to cut costs. Deltona, Florida, stopped curbside pickup altogether. Many recycling and solid-waste organizations, as well as the US EPA, have dedicated resources and staff to “identify solutions to be able to help support recycling here in the US,” according to Dylan de Thomas, vice president of industry collaboration at the Recycling Partnership, a nonprofit that gives grants to and works with communities to improve their recycling programs. The EPA, which has typically left leadership on recycling to local governments, held its first-ever recycling summit in November 2018. This emphasis on outreach suggests a heavier onus on citizens to stop tossing items absentmindedly into the bin, and start disposing of them in a more informed, deliberate way. DC. also did a pilot program with the Recycling Partnership to provide curbside feedback for residents. On one route, staff left a note behind for residents who had plastic bags in their recycling bin. Another route was the control, and staff did not leave tags. The route that gave residents feedback in the form of tags saw a 19-percent drop in plastic bags over the course of two weeks. The control route? An increase in bags of 2 percent. What can and cannot be recycled, as well as how recyclables are separated, differs based on where you live. Montgomery County, for example, has a dual-stream model. Residents have to sort their recyclables into two groups: commingled materials (bottles, cans, and containers) and mixed paper (cardboard and paper). Under a single-stream approach, by contrast, residents throw all household recyclables into one bin, separate only from non-recyclable trash. DC has a single-stream system. Back in Maryland, China’s policy hasn’t led Montgomery County to stop recycling anything. It continues to generate revenues from all the materials it recycles, Kao said, except mixed-color, broken glass, which it pays to recycle because it has little value. The county sells the majority of its bales domestically. In fact, one silver lining to China’s crackdown is a growing domestic market in the US More than a dozen North American paper mills have announced new capacity to process recycled paper, although it will be a few years before all of it comes online. In any case, there are strategies that local programs can use, either separately or in combination, to find their way back to health and continue recycling waste. China’s policy change may not represent the much-feared “end of recycling” in the US so much as an inflection point.